What is urban living and who really cares? “80% of Canadians live in cities, but only a small part live urban,” reads one of the tweets in a recent tweeter debate by a few of us urban nerds. I tweeted the author asking what his definition of urban living was, but got no answer. Indeed, too often people – including urban designers planners, architects, engineers, politicians, developers and yes, even myself use terms that even we don’t really have a shared meaning of and/or doesn’t make a lot of sense to others. I have often thought the term “urban sprawl” should more aptly be called “suburban sprawl” as what is being referred to is the sprawl of low-density predominantly residential development at the edge of a city, areas commonly thought of as suburbs. But, I digress; perhaps a topic for another time. Urban living is about diversity? Young and old? Bikes and pedestrians? Residents and retail? Do you have to live in a community with a certain density to be considered urban living? Is urban living measured by the percent of time you walk vs. take transit vs. drive? Does urban living mean not having a car? Or, is it driving less than the Canadian average of 18,000 km/year? Is urban living about the size of your house, condo and/or vehicle? Is urban living about residing in communities with a diversity of commercial and residential buildings? I thought a Google search might help, but I struck out. Unable to find a nice clear and concise, definition I went “old school” and checked some dictionaries. They all just said something about “living in a city,” much too ambiguous to satisfy me. Urban living is about living on the streets? Food carts in Portland's suburbs encourage street dining. Urban living in Calgary's West Hillhurst? Stats Canada went further, identifying three distinct types of population centres: small (population 1,000 to 29,999), medium (population 30,000 to 99,999) and large (population 100,000 or greater). They go on to say, “It also recognizes that a community may fit a strictly statistical definition of an urban area but may not be commonly thought of as "urban" because it has a smaller population. Or, functions socially and economically as a suburb of another urban area rather than as a self-contained urban entity. Or, is geographically remote from other urban communities.” Have I lost you yet - it is getting very muddy for me! Despite its change in terminology, Statistics Canada’s current demographic definition of an urban area is “a population of at least 1,000 people where the density is no fewer than 400 persons per square km” (which would include all of Calgary’s 200+ communities). Dig a little deeper and Statistics Canada defines low-density neighbourhoods as those where 67% or more of the housing stock is composed of single-family dwellings, semi-detached dwellings and/or mobile homes. A medium-density neighbourhood is deemed one where the percentage of single-family, detached or mobile homes is between 33 and 67%, while high density is where these types of dwellings comprise less than 33% of the housing stock. By this, Stats Canada identifies six high-density neighbourhoods in Calgary (they didn’t name them), by far the least of any of Canada’s major cities. Perhaps the author of the tweet meant only those Calgarians living in Calgary’s six, high-density neighbourhoods are living urban? Urban living is about great public spaces, like this one in Strasbourg, France. Intensity: A measure of the concentration of people and jobs within a given area calculated by totaling the number of people either living or working in a given area. Complete Community: A community that is fully developed and meets the needs of local residents through an entire lifetime. Complete communities include a full range of housing, commerce, recreational, institutional and public spaces. A complete community provides a physical and social environment where residents and visitors can live, learn, work and play. So, where does that leave me and others who are interested in a meaningful debate about how we work together to build a better city. What would be a useful definition of “urban living” that professionals and the public to agree upon as the on debate how best to “urbanize” Calgary continues? Brookfield's SETON mixed-use community on the southern edge of Calgary will offer many of the same urban experiences as living in Calgary's City Centre. Calgary's new suburbs are being as complete communities with both a density and diversity of residential dwellings (single-family, town homes and multi-family) that would make them a medium to high density community. It will take 15 to 20 years to achieve this; don't be too quick to judge! One potential definition of “urban living” might be, “living in a place where you can comfortably walk, cycle or take public transit to 80% of your regular weekly activities (i.e. work, school, shop, medical entertainment and recreation). As for The definition of “comfortable,” I leave up to the individual. For some, a comfortable walking distance might be 15 minutes; for others it might be 30 minutes. I know Calgarians who take the bus or even drive the two kilometers from Mission to work downtown, while others cycle 15+ km to work (and back). I myself used to walk 50 minutes to and from work downtown for 10+ years. High-rise living in Edmonton's downtown. Downtown Calgary's West End. Are condos just vertical suburban dwellings? Low-rise condos on a residential street in Mission. But really, does the average Calgarian even care if they a live urban or suburban? Thanks for indulging me. I hazard a guess to say most don’t. And there’s nothing wrong with that. I highly suspect they just want to be able to get to their activities in a timely, affordable manner. Yet for us urban nerds, we are always thinking about how can we build a better city for everybody, one that is more cost-efficient, environmentally-friendly, affordable, integrated and inclusive. It’s what turns our cranks! GG writes: "Initially the definition was applied to the rural/city divide, and has since become a true city ‘divide’. It doesn’t seem to matter than many of these ‘urban inner-city communities’ were the suburbs of a few decades back, and the reasons that people built there and moved there are no different than those today. By virtue of Calgary’s rapid growth, they are now close to the city center and have developed a ‘cachet’. This was not a result of great urban planning, foresight, or any attempt at smart growth. The densities in many of these communities are less than they are in the ‘reviled’ suburbs that are being built today. They were the product of development methods of the day, and schools and community centers were part of the package. Families were one car or even no car, and transit was a common denominator. And today, it is all too common to see perfectly liveable houses bulldozed so that the affluent can enjoy a big house but be environmentally and developmentally superior by being an urban dweller, an inhabitant of the inner city." CW writes: "A most excellent column. Certainly people do care very much about their urban living, yet our language completely fails to capture how we choose to situate ourselves in life. Why would that be? Everybody knows it's not good manners to talk openly about class, but a definition of urban living should take into the account the ability to insulate oneself from undesirable situations of class. Most people love the city they choose to live in, but they also wouldn't be caught dead in some parts of it." Don't be too quick to just the new suburbs? West District is a proposed new MAC (Major Activity Center) community on a 96-acre site that straddles the southwest communities of West Springs and Cougar Ridge by Truman Developments. The boundaries are north of 9th Ave., west of 77th Street, east of 85th Street and south of Old Coach Banff Road in the southwest. West District is a unique infill MAC community, as the land surrounding it has already been developed for several years. Most new MACs are at the edge of the city with no surrounding communities. As a result, Truman Development’s team of planners and urban designers have been able to respond to what currently exists, as well as what is missing for the West Springs and Cougar Ridge to become a vibrant live work play community. They were also able to respond to the City’s guidelines for creating successful MACs, which were not in place or not possible given most of the previous developments in West Springs and Cougar Ridge were on small parcels of land with fragmented ownership making master-planning impossible. Over the past year, Truman Development has embraced the City’s vision of creating a vibrant new mixed-use, mixed-density communities in consultation with the community. This image illustrates how West District (the block of land in the middle of the image) is surrounding by low density development. West District is essentially a mega infill project. The concentration of trees in the middle will become part of the new communities Central Park. One of the first things Truman did right was to engage the existing community from the start, not after they had developed a comprehensive plan. Rather than the old open house format where developers would present their vision after it was completed and then defend it when the individuals in the community raised questions and concerns. They decided to open what they called the EngageHub in the spring of 2014, a purpose built 2,000 square foot building where people could visit, learn more and weigh in on some of the ideas being considered for West District. Since opening, the EngageHub has been open to the community 130+ hours (weekdays, weekends and evenings) for people to drop-in to see how the West District plans were evolving based on community input. The pretty little EngageHub looks like a cafe. In reality it is the an open meeting place where the developers and the community can meet and discuss ideas, options and issues that will create a vibrant urban village that will be a win for the community, developer and the City. The EngageHub is full of books that people can read and get ideas from about what they would like to see in an urban village. For me urban development and placemaking is an art not a science. As with almost every new development in Calgary the biggest issue is always density. Too often the developer is put in an awkward situation as the City is demanding more density, but the existing community doesn’t want it. For example, West District’s density is envisioned to be 36 units/acre, which is 10 times the current density of the surrounding developments. However, when you average the density of the existing communities with the addition of West District the overall MAC density would be 5.3 units/acre, which is less than the City’s current goal of 8 units/acre for new communities and not that different from the 3.1 units/acre that currently exists. Too often the public hears the term density and immediately thinks 20 storey highrise condos, but in fact the density for West District and other proposed MACs will be achieved with a mix of single-family, town/row housing and some low and mid-rise condo bulidings. This allows for a diversity of housing options that will be attractive and affordable for first homebuyers, families, empty nesters and seniors housing. Indeed, vibrant communities include people of all ages and backgrounds. Truman Developments is Attainable Homes Calgary’s biggest multi-family partner and they are keen to see a healthy mix of market housing with some more affordable units in West District. This is an example of the scale of the proposed condos with ground floor retail. You can also begin to see the wide pedestrian friendly sidewalks and clear cross walks. Over the past seven months of community engagement one of the things Truman heard loud and clear was the need for a park to serve both existing and new residents. One of the community’s desires was to retain many of the existing and beloved Aspen Tree groves. As a result, the design team has developed large central park that balances passive natural areas with programmable activity areas, which will allow for year-round use. Another key issue for existing residents when new developments are planned is the ability of roads and transit to handle the increased traffic. While the West Leg of the LRT does provide improved transit service to the Calgary’s west-side communities, it is unfortunate that is it is surrounded by low-density communities rather than something like a West District. 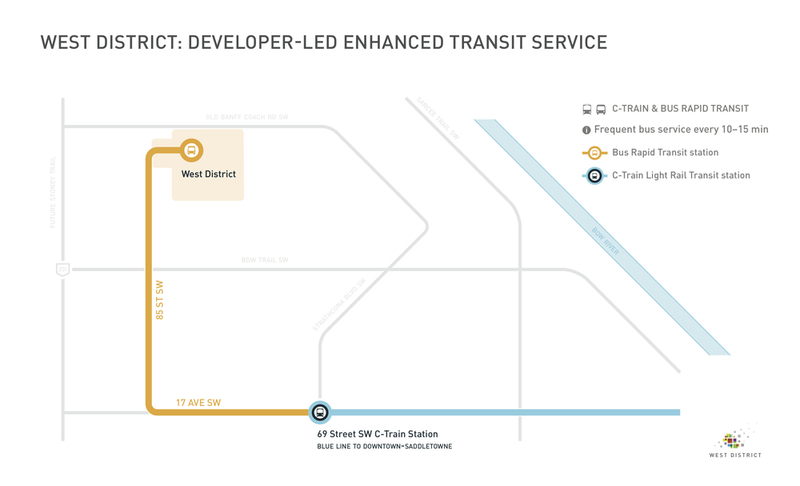 To capitalize on the City’s 1.4B investment in the West LRT, Truman Development is proposing a developer-funded express bus between West District and the 69th Street LRT Station, about four kilometers away. Kudos to Truman Development for taking this innovative initiative. West District is an infill development and as such the area has already been serviced to urban standards for water and sewer, which means no addition costs for new infrastructure. There is also a good network of existing major and arterial roads that will be further upgraded with the completion of the west leg of Stoney Trail. In addition, West District will add an estimated $550M in new residential and business taxes over the next 50 years, which is significantly more than the $130M that would be generated by a typical low density suburban development. The additional half billions dollars can be used for new or enhanced parks, recreation centres, as wells as new buses or roads across the city – everyone benefits from mega infill developments like West District. One of the barriers to creating new urban villages in established neighbourhoods, especially on the west side of the city is the fragmented ownership. It becomes very difficult to assembly the large tract of land needed to develop an integrated plan of mixed-uses. The opportunity to create a new community like West District on the city's west side is very limited. West District calls for low density residential on the south side next to single family homes, with low-rise condos and offices on the north side with a traditional grid street pattern which will server to create the Kensington-like community. In many ways, West District is like building a new Kensington community on the west side of the city. In fact, the new condos in Kensington - Pixel, St. John’s, Lido and VEN – are very similar to what is being proposed for West District. There are also similarities between West District’s Central Park and Riley Park and West District’s main street and the mix of shops along Kensington Road and 10th Street. One of the criticisms I often hear from new comers to Calgary, especially those from major urban centres is we don’t have enough walkable urban communities like Kensington, Beltline or Inglewood. No plan is perfect, however, I am thinking the City should be fast tracking the approval of West District if we are serious about providing attractive, affordable and accessible housing for both existing and new Calgarians. Brookfield Residential: Working together to make Calgary better! After six weeks of recently wandering the streets of Dublin, Florence and Rome, I was puzzled by the lack of new public art (approved by a public process), appalled by the abundance of graffiti and intrigued by the street art (no public approval). There was really only one piece of what looked like new public art that caught my eye. It was in Rome, in the tiny off-the-beaten path Vicolo dell’Oro square. The piece “Personal/NonPersonal” by Simone D’Auria was commissioned by the Gallery Hotel Art which is located next to the square. A very ambitious piece that encompasses the entire square, it has 18 ghost-like man/animal figures strategically placed from the earth to sky, including several figures climbing the side of the building. The artwork represents an imaginary world populated by white creatures with a human body and the head of an animal. The inspiration has its roots in the past of those great men who have made the city of Florence and its history and who repesented themselves through emblems depicting the head of an animal followed by a motto that extolled the value and virtue of action. Some examples? The turtle with a sail for Cosimo I, symbol of prudence combined with the power of action; a rhino for Alessando de Medici to symbolize his strength and strong will; a weasel by Francis I, the symbol of cunning. "Today, in my work, those animals and the meanings they carry with them become faces of men and women, ironic caricatures in which they can identify themselves, visible expression of their deepest inner values; portraits, in fact," says D'Auria. The circus-like animation is a welcome relief in a city dominated by somber ruins of past cultures and statues of people long passed away. It was definitely a refreshing and welcomed surprise. I can’t help but think that an artwork like this would be a good addition to downtown Calgary. It would be very appropriate for a space between the many two-tower office blocks or for the alley space between the towers of the Hotel Le Germain project on 9th Avenue SW. While Calgary invests millions of public and private dollars into public art, in Florence and Rome, temporary free street art seems to be the rage. 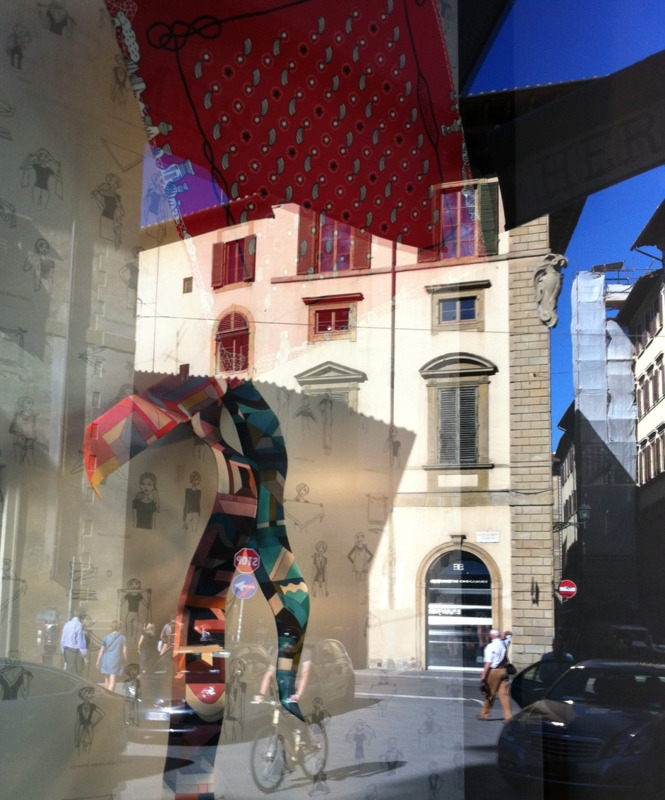 Very soon after arriving in Florence, I started to notice the appearance of faceless, simple cartoon-like stick figures with balloons and words like “exit, freedom and resistance”. For me, it soon became a fun game of spotting the next piece. And they were all over the place! Later, I found out by googling that the no-name artist was from Pisa, Italy a hot bed for street art. The title of the project is “Exit/Enter” with the purpose being to tickle the imagination of street spectators, to be a catalyst for a smile or a smirk and maybe even be a bit thought-provoking as one tries to understand the ongoing narrative. I thought the title was very appropriate as the streets and alleys of Florence are full of doorways and corners where people are always entering or exiting. While walking around Florence’s San Niccolo district we discovered a t-shirt shop with some very interesting street-sign decals so we popped in. We quickly learned that they were the work of CLET, a very well-known, European street artist who has his studio in the area at Via Dell’Olono 8r. CLET cleverly alters road signs around cities with removable stickers. Seems the local authorities tolerate the work, which again adds humour to an urban landscape polluted with street signage. Once, we knew about CLET we started to find the altered street signs everywhere. This is the entrance to CLET studio. The Fish sign is CLET's, the hear and stick figure is from the "Exit/Enter" project and the blue piece is by Blurb another street artist (see below) and butterflies by another artist. I am not sure who did the guns or the black figure with paint roller. A third street artist, Blurb, takes on major masterpieces of art and dresses them up in scuba gear. The title of the project is “Art knows how to swim” and while I have no idea was the meaning is, they too added an element of fun to serious works of art like Leonardo da Vinci’s Mona Lisa and Michelangelo’s David. Many of the works on paper are ripped and faded to the point where they blend right in with the urban patina of the city. In Rome, we didn’t find any new public art or graffiti street art like Florence (though we did find a few Exit/Enter pieces). However, in the graffiti-filled streets of the San Lorenzo district near the university, we found the motherlode of street art. Along the retaining wall of a playing field in an elevated park are two block-long linear art galleries with works by various artists intertwined to create a powerful statement about the area’s sense of place. These are not the refined, pretty, decorative street art works you see in some cities, but rather the evolution of graffiti and tagging into expressionist paintings full of social and political protests. In some places, it was hard to tell where the graffiti ended and the street art began. A typical streetscape in San Lorenzo. One side of the street art wall. The second side of street art wall is devoted to the work of one artist. Street art on the security doors of a shop. Earlier this year, Calgary experimented with some street art on the retaining walls of the busy pedestrian (4th and 14th Street SW) underpasses connecting 9th and 10th Avenues. And although in most cities street art is painted without permission on public and private walls and is permanent, most of Calgary’s street art is approved and temporary. For example, this past May, as part of the Beakerhead, program Michael Mateyko and Hans Theiseen (also known as Komboh) created a pair of 27-foot long murals on 4th Street and 12-foot murals on 14th Street. Eco-chalk graffiti, an environmentally-friendly product that can be easily removed was used. The murals consisted of several cartoon robot-like figures that mimicked people walking to work. As well, in East Village, Calgary Municipal Land Corporation organized two interesting temporary street art projects. The first “I am the River” by Derek Besant and the current “The Field Manual: A compendium of local influence” by Calgary’s Light & Soul Collective, both using the new RiverWalk’s bridge abutments, storage sheds and robo-bathrooms as their canvas. 4th Street Mural from the other side of the underpass. The 4th Street mural pedestrian perspective. Example of one of the fun and clever cartoon characters. Love this cartoon of a woman walking with her briefcase and plugged in to the sky aka icloud. Somehow I felt this signage took some of the fun and spontaneity out of the work. One has to wonder if Calgary and other cities would be better served by encouraging more temporary street art, both approved and unapproved, than expensive permanent public art works. Not only is street art cheaper, it doesn’t have any maintenance costs and if the public doesn’t like it, well, it will literally disappear in a few months or years. Found the juxtaposition of the bike and the skeleton figure quite provocative. Putting the public back into public art! I have a theory. In fact, I’ve had it for some time. Simply stated, it is Safety + Segregation + Space = Sterility. I’m inspired to publicly share it after my recent conversation with Mel Foht, President and COO of Royop Development Corporation. Having just returned from his trip to Europe, we began talking about safety, segregation and public spaces as well as how Calgary differs from European cities in its approach to urban design. “Are Calgarians obsessed with safety? Are we making our urban spaces and places too safe?” These are questions I’ve often wondered. Though many readers may well disagree, I’d hazard a guess to say Mel and I aren’t the only ones who think we are correct. If we want our streets to be safer, the first step might be to get all walkers, joggers, cyclists and drivers to unplug from their headphones. We need to take a page from the peewee hockey players’ manual – “keep your head up if you don’t want to get hit.” Whether on the sidewalk or street, we all need to look ahead and around to be aware of our environment. Street safety is a shared responsibility. In Salt Lake City, many of the cross walks have a reminder to look both ways. Salt Lake City takes cross walk safety as step further by providing bright orange flags for pedestrians to use as they cross the street. Is this going too far? Four-way stops are easier for pedestrians, cyclist and drivers to share the space and are a lot cheaper than round-abouts and speed bumps. Calgary roads for the most part have lots of room for pedestrians, cyclist and drivers if we respect each other and share the road. Share The Road signs are a good reminder that EVERYONE is responsible for sharing the road. And then there is food safety. Foht gives kudos to Mayor Nenshi and Council for fast tracking the licensing of food trucks a few years back. Calgary has about 45 food trucks (Portland, a city renowned for its street food culture, in comparison has over 500). It should be noted that Portland’s food carts are permanent street vendors (not trucks) and are often clustered on under-utilized parking lots. In fact, their downtown even has a block-long, surface parking lot ringed with food carts which creates a festival-like, outdoor food court. But as Portland, unlike Calgary, doesn’t have dozens of major office buildings each with their own food court, it is hard if not impossible to make any apple-to-apple comparison. I am told Calgary once had the reputation for having some of the toughest food safety laws in North America. While on one hand that’s important and good, it basically restricted the food options by street food vendors to mostly hotdogs. If other cities can have rules that ensure food safety yet enable a wider variety of foods to be cooked and served on the street, we surely can too. Portland has become a mecca for foodies partly as a result of the numerous food carts that transform surface parking and vacant lots into outdoor food courts - not just in the downtown but around the city. Safety also plays a key role when it come to the dominance of the car as the preferred form of transportation, not only in Calgary but I suspect in most North American cities. We experienced this firsthand in Memphis one morning this past winter when my wife Brenda planned to take a 20-minute bus ride from downtown to a shopping area. When ATM issues forced her to go into the nearby bank to talk to a teller, conversation ensued (which included an informal poll of all four tellers as to if she should take the bus or a cab) and a decision was made (solely by them) to call a cab - without Brenda’s permission and at her cost of 25 dollars! (Note: she took the bus back with no concern whatsoever re: her personal safety and at a cost of $3.) This was not an isolated case – another day she was warned by locals (including a female tram driver nonetheless) to not take public transit alone. Clearly to us, whites in Memphis feel safer in their car than walking the streets or taking public transit. We also now better understand the current situation in Ferguson, Missouri. And safety is even shaping Calgary’s suburbs. The popularity of drive-thru coffee shops, ATMs and fast food stores is not only about convenience but also perceived safety. In many ways, by segregating the modes of traffic in Calgary’s downtown core - for example, 9th Avenue for cars, 8th Avenue for pedestrians and 7th Avenue for transit - we have virtually eliminated the urban vitality that comes from diversity and critical mass. It is interesting to note that while in the early 20th Century, 8th Avenue accommodated street cars, vehicles and pedestrians, a century later we are arguing whether even pedestrians and cyclists can share the space. We have also segregated our activities in a way that chokes off vitality. Think about it. Most of Calgary’s cultural activities are clustered in the east end of downtown, creating a cultural ghetto away from the banks, offices, shops and restaurants. With most plays, concerts, shows, gallery events, festivals, etc happening on weekday evenings and weekends, there’s little need for most to go there during weekday days – other than to simply use it as a pass-through block to get to and from City Hall. As well, most shops have been segregated to the +15 and +30 levels between the Hudson’s Bay and Holt Renfrew. Few small shops dot Stephen Avenue Walk itself. This stretch of 8th Avenue has become a restaurant ghetto, with vitality basically just around weekday noon hours. Recently, when touring a visiting architect from Holland and his family in the area, they couldn’t believe how the Walk changes at noon hour on weekdays. It is a phenomenon – not necessarily a great one though. Early 20th century postcard of Stephen Avenue with street cars, vehicle and pedestrians sharing the space. Salt Lake City allows cars, LRT and cyclist to share the road. 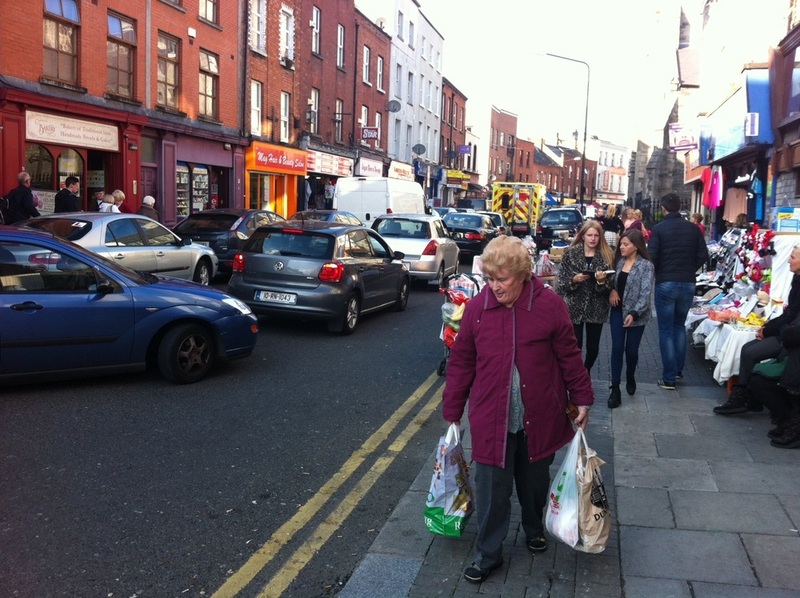 In Dublin, as in most European cities, the streets and sidewalks are shared by everyone. The sidewalks are narrow and the roads are crowded with pedestrians, cyclists, motorcycles and cars all interacting at close quarters. Foht speaks of how Europe’s sidewalks and streets are animated with people doing lots of different things, going in lots of different directions and using lots of different modes of transportation. It is not unusual, he says, “to see pedestrians, cyclists, scooters, trams, buses, cars and trucks all mixing and mingling on the same street at the same time.” Urban guru Jane Jacobs referred to this as “sidewalk ballet;” others call it “messy urbanism,” while yet others call it “critical mass.” Regardless of what you coin it, great urban spaces are crowded with people who access the space by a variety of transportation modes. He also noticed that in Europe people were able to share the smallest space that allow “a zillion scooters and bikes to co-exist.” In Calgary, we can’t even seem to get the fact that the sidewalks on in the Peace Bridge are for pedestrians while the middle roadway is for cyclists. And while European streets may look like a free-for-all to us, they in fact are very safe. Does this mean they have more or better signage? Not necessarily. In fact, many European cities are experimenting with removing signs, allowing roads and public spaces to be self-governing. We seem to enact the polar opposite approach, ie. more signage and more complicated signage. Perhaps we are too busy trying to read and understand the signs instead of just having some basic signs and rules and then just using common sense. For some reason, it seems that part of Calgarians’ psychological DNA includes the need for lots of space around us – big houses, big vehicles, big streets, etc. Granted, it is what we have had and in most cases, what we continue to have; it is what we are used to. For us, the extent of “crowded spaces” experience consists maybe of rush hour transit rides and at Stampede or major street festivals. If we want to create street animation, we need to learn how to share our space. I am a big fan of “Share The Road” signs, four way stops and painted bike lanes as cost-effective traffic calming measures vs. speed bumps, roundabouts and separate bike lanes. Why is it that Calgary always seems to find the most expensive way to manage the sharing of our streets? If we really want urban vitality in Calgary, we can’t live in our own individual bubbles. If we really want a sense of community, we have to be aware of and connect with others, embrace sharing public spaces and avoid “safety-phobia.” Safety + Space + Segregation = Sterility – it’s definitely not an equation I want for Calgary. By Richard White, November 1st, 2014. An edited version of this blog appeared in the Calgary Herald's New Condo section on November 1st, 2014. Drivers, pedestrians and cyclists need to learn to share. Calgary: A Bike Friendly City? Design Downtown for Women and Men Will Follow? On some of the Dublin tourist maps you will see a large pink area titled "The Liberties / Antique Shop Quarter," but there is no information on where the shops are within the quarter. The Dublin shopping map doesn't have any information about shopping in the area either. But with a little digging, we found out that there are a dozen or so antique and vintage shops along Frances Street and just a block away on Meath, is the Liberty Market (Thursday to Saturday). The name ( Liberties) is derived from jurisdictions dating from the arrival of the Anglo-Normans in the 12th century. They were town lands that were part of the City of Dublin, but still preserving their own jurisdiction. Hence, "liberties." The most important of these liberties were the Liberty of St. Sepulchre, under the Archbishop of Dublin, and the Liberty of Thomas Court and Donore belonging to the Abbey of St. Thomas (later called the Earl of Meath's Liberty) - hence Meath and Thomas streets. The current Liberties quarter's boundaries are between the river Liffey to the north, St. Patrick's Cathedral to the east, Warrenmount to the south and St. James's Hospital to the west. We decided to check out The Liberties district on a sunny Saturday afternoon in October and had a FAB time. Starting at the north end of Francis Street, we were surprised to find a large surface parking lot tucked away behind a building that was full of graffiti art reminding us of Boise, Idaho's popular tourist attraction - Freak Alley. Just one of a dozen or more graffiti murals at the north entrance to Dublin's Antique Row. Walking just a bit further, we arrived at Dublin's Antique Row beginning with O'Sullivan's Antiques - look for the building with the piano hanging off the side of the building. This is the spot for serious antique collectors and the staff are very friendly and knowledgeable. We were surprised and impressed with the collection of 1950s whale bone vertebrae. A few doors down is Michael Mortell's impressive store of unique mid-century modern furniture and accessories. As you proceed down the block, proceed down the block to discover more antique stores, second hand stores, a gallery and even a larger Oxfam Charity shop (what we call thrift stores). We definitely enjoyed our stroll. At the end of Francis Street, turn left and you are at St. Patrick's Cathedral. The afternoon sun provided us with a wonderful sun-drenched perspective. We stopped for lunch at the tiny Cathedral Cafe with its six tables. It was a busy place, the owner cooking and serving up the tasty meals - we were exhausted just watching her. 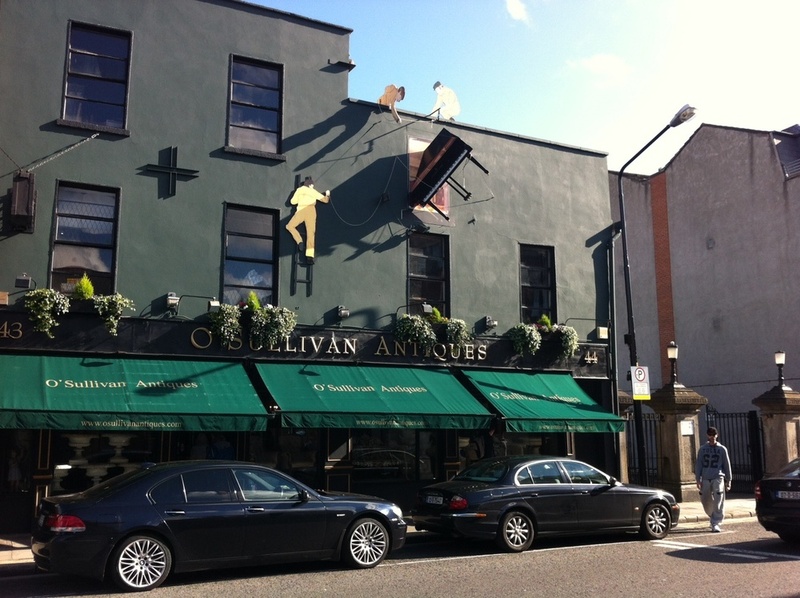 O'Sullivan's Antiques with funky delivery men climbing the wall with the dangling piano. Inside Michael Mortell's exquisite mid-century modern boutique. The antiques spill out onto the street. Cat Meow was full of shoppers searching for vintage fashion finds. Anonymous vintage / retro store is a must see. Indeed we had a FAB time on Francis Street. Watered and fed, we were ready to tackle Meath Street, which we were told by one local is a bit gritty or in his terms "Dublin unpolished." We turned the corner and were immediately hit by a wave of people and cars - the street was like Costco at Christmas. I think this is what Jane Jacobs (urban living '60s guru) was talking about when she coined the phrase sidewalk ballet. However, in this case it was a "street ballet" with cars, teens, seniors, couples, families and the odd horse sharing both the street and sidewalk space. In addition to the eclectic shops, bakeries, groceries and butchers was the Liberty Market with its cheesy flea market stalls selling everything from lamp shades to purses. It was urban chaos at its best. We loved mingling with the locals. There is also the historic St. Catherine's Church mid-block with the secret Our Lady of Immaculate Conception grotto at the back which we discovered by accident. It is a wonderful place for a little solitude and reflection. Here met Debbie, who comes often to light a candle and say a pray for her recently deceased husband. Just a block away, locals of all ages were shopping up a storm on Meath Street. Liberty Market purse vendor's wares. Somebody found some good deals. Our Lady of Immaculate conception grotto. Once we got to the top of Meath Street at Thomas Street, we headed east (left) to find a pub. Just by chance, I looked up an alley (I like to do that) and saw a horse. Curious, we wandered up the alley and got chatting with an older gent who, with his young sidekick, who were cleaning up. Happy to share the alley's history, he told us it has been home to stables for over 300 years. At present, the stables house 30 horses for the City Centre's horse-drawn buggies. You won't find this on any tourist map. Horse alley where horses and people have shared the space for over 300 years. Little did we know this same two-year old male horse was a bit of a media celebrity for his unexpected visit to a local horse race betting establishment. We had a FAB Saturday afternoon hanging with the locals, just a few blocks away from the hoards of tourists that invade Dublin's City Centre everyday. West District: Community Engagement Gone Wild? It wasn’t that long ago that suburban developers in Calgary created a new community master plan, presented it to city planners, got comments, made changes, held a one night community open house (if there was another community close by), integrated the community’s input and then got the “go ahead” from the city. But no longer is one, or even a few open houses sufficient to get the City and the community’s approval for new developments – large or small. In 2003, the City of Calgary adopted a community engagement (CE) policy called “Engage” that governs how both the City and developers must work with citizens (stakeholders) to ensure they are informed and engaged in all developments that impact their quality of life. Over the past 10+ years, community engagement has become more and more complex. The City even has an “Engage Team” with a director and manager to ensure the proper engagement protocol has been followed not only by the private sector, but also by City departments. The EngagementHub aka EngagementHug along 85th Street in the community of West Springs. At first, developers were hesitant to embrace the idea of CE, but today most developers understand the need to get community support before you go to City planners, not after. Then in June they opened a purpose-built “EngagementHub” building on the 700 block of 85th Avenue SW. This 2,000 square foot EngagementHub that looks like a hip café from the street, was open for four weeks in June/July to talk to the community about “neighbourhood building” principles, then for another four weeks in August/September to share visuals around a proposed vision based on previous input. The plan is for it to be open again in October to present even more detailed information. That is a total of over 200 hours of pre-application open houses - and, this doesn’t include all of the private meetings that have taken place with individuals and the community associations! Is this an example of “community engagement gone wild?” Have developers finally abandoned the 20th century “design and defend” model of community planning i.e. the developer and consultants spend hundreds of hours and millions of dollars developing a master plan and then defend it to the public and planners. The EH is full of large concept renderings of sample streetscapes with shops, restaurants and patios, as well as concepts for modern, Paris-scale condos (six to eight floors high) and park spaces. There are also worktables and lots of urban design books for the public to leaf through and share their ideas on what West District should bring to their community. While some would say Truman’s vision for West District is like Calgary’s Kensington shopping district, in fact, it is the other way around - West District is what Kensington is trying to become as it starts adding more condos into its mix of existing shops and single-family homes. Perhaps a more fitting name for Truman’s EngagementHub might be the EngagementHug as Truman has totally embraced the idea of community buy-in upfront, not at or near the end of the approval process. I can’t help but think the developers who so clearly seek community input should be rewarded with an accelerated approval process. If the community supports the development, why should the City delay its approval - especially given it won’t cost the city a penny to service the land. This is in fact a mega infill project. Inside the Engagement Hub is a massing model of the proposed community, along with lots of display boards with facts, figures and pictures. Just a small section of the post-it board full of ideas and concerns left by visitors. A works station with survey questions and interactive presentation screen. Just a few of the resource books available for looking up ideas. Interactive video screen with all of the key information at a touch. West District is a 96-acre, master-planned new community in West Springs, at the corner of 85th Street SW and Old Banff Coach Road. Truman’s vision is to create a new walkable, mixed-use community with 3,500 residences (that could house 7,000+ people), as well as 500,00 square feet of street retail (think Kensington Village) and 1.2 million square feet of office space employing about 5,265 people. This is significantly different than the 700 residences (for 1400 people) and about 200 jobs that the current zoning allows for. Truman’s vision fits perfectly with the City’s vision of walkable suburban development. In the past, new communities might have 3 to 5 units/acre. West Springs and nearby Cougar Ridge (WSCR) has a current density of only 3.1 units per acre. West District’s plan calls for 36 units per acre, which, while 10 times the current density, would only increase the overall density of the WSCR to 5.3 units/acre, well below the City’s 8 units/acre benchmark for new suburban development. You would think it would be difficult to sell the idea of a modest density, mixed-use community in the middle of an existing upscale, suburban single-family community like West Springs. However, to date, while some have questioned the idea of an urban village in the suburbs, everyone seems to have appreciated the opportunity to participate in shaping the future of their community. It will be interesting to see how the vision evolves as it enters the final stages before submission to the City later this fall. Kudos to Truman Development Corp., Intelligent Futures and CivicWorks Planning + Design for establishing a new benchmark for community engagement in Calgary. Conceptual condo rendering with ground floor shops and seven floors of residential. It should be noted that Truman is both the developer and builder so what you see should be what you get. In most new communities, the developer creates the vision and then sells parcels of the land to builders who interpret the vision and often make changes from the conceptual drawings. Proposed land use map for West District. Not how streets link with existing community to the east. Map of the fragmented ownership of the West District site. One of the issues the City has for development of the land on the west side of the city is fragmented ownership, which doesn't allow for comprehensive community planning. Truman has been able to get development agreements with all of the landowners, which then allowed them to develop an integrated community vision. More and more Calgary is seeing development of urban villages outside of the inner city – including Brookfield’s SETON in the southeast and Livingston in the far north. Traveling out to West Springs area is like traveling to a different city for an inner-city guy like me. Who knew that 85th Street is the new 4th Street with Mercato West, Vin Room West, Blue Door Oil & Vinegar and Ohh la la Patisserie? Maybe they will even host the Lilac Festival in the future! With the predicted average of 20,000+ people moving to Calgary each year for the foreseeable future, the City and developers must find a way to work together to facilitate the approval of one of these urban villages every year, in addition to developments in new suburbs and inner-city communities. And although I realize planning approval resources are tight, the City must find a way to expedite projects like West District that help fulfill the City’s vision of creating walkable new communities. It must not be delayed it in a heap of red tape. Calgary: Urban Forest vs Tree Abuse? Recently, Toronto-based Lamb Development Corp. announced it would be creating orchard between the two condo towers on 12th Avenue next to Stampede. I thought this was a strange idea being Calgary is not know as fruit belt by any stretch of the imagination. But after a little digging I learned that since 2009, the City of Calgary has been planting fruit trees and shrubs as part of a pilot community research orchard program. The three pilot orchards are in Hillhurst-Sunnyside (50 trees), Baker Park (100+ trees) and Ralph Klein Park (no number given on city of Calgary website). The first two focus mostly on apple trees, while the later will consist of a variety of pear trees. The City of Calgary recommends two varieties of apple trees - Prairie Sun and Prairie Sensation, both are about six feet tall and produce about 20 lbs. of apples when mature. The two varieties of pears recommended are “Ure” and “Early Gold.” The “Capilano” apricot is also recommended, as are several varieties of cherries. Fruit bearing shrubs include the “Hinnomaki Red” gooseberry, American Hazelnuts, Honeyberries or Haskaps. A quick check of Calgary greenhouse and landscape websites confirmed that indeed, several other varieties of fruit trees would grow well in Calgary. In fact, I forgot but when we moved into our house in West Hillhurst (aka Grand Trunk) in there were two mature apple trees in the neighbour’s backyard that produced a massive amount of apples. They removed the trees a few years later as the apples quickly drop to the ground, became very mushy very quickly, becoming “wasp magnets. They weren’t much good except for applesauce, which we ate a lot of that summer. At this time, the City has no plans to create more community orchards, but interested individuals should contact their community association if they are interested. The city might consider facilitating an orchard in your community – could be in a pocket park, community garden or along the boulevard near your home. The City even has an “orchard steward” program i.e. someone who takes an active role in caring for and maintaining an orchard by pruning, monitoring health and harvesting the fruit. Apple tree on the front lawn of a century old home in Inglewood. While digging I also found out a lot more about Calgary’s urban forest. Indeed, Calgary’s urban forest is a remarkable achievement given the City’s climate doesn’t naturally support trees. It is estimated that 3% of trees in Calgary’s urban forest die annually. Early photographs of Calgary show a treeless prairie landscape, however in the 1890s William Pearce, envisioned Calgary as a “city of trees,” developing an experimental farm with an irrigation system so he could grow more types of trees. His home and farm is now known as Pearce Estates Park, located at the far east end of Inglewood where the Bow River turns south. He also encouraged Calgarians to improve the appearance of the City by planting trees around their homes. And, in 1899, the City Council passed not only the first tree protection bylaws, but also started promoting tree planting. Today, Calgary boasts 445,000 trees in our groomed parks and boulevards, worth an estimated $400 million. The value of individual trees ranges from $300 to $33,000. The most valuable trees are a pair of American Elms in Rideau Park. In our natural areas, there are several million more trees – Weaslehead Flats alone having an estimated 3 million trees. This Bur Oak is a heritage tree on Crescent Road was planted in 1937. Heritage Elm tree in the middle of a Stampede PARKing lot. The Sunnyside urban forest didn't exist 100 years ago. One of the key tree management tools of the City today is to collaborate and engage with citizens to enhance our urban forest with community awareness and education, tools and shared stewardship opportunities. For example, the “Symbolic Tree Program” which allows you to commemorate a birthday, wedding, anniversary or any other day by planting a tree in a city park. The BP BirthPlace Forest which between 2001 to 2009, planted trees over 50,000 trees at nine sites across the city to reflect the children born in the city each year. The City also has a Planting Incentive Program (PIP) where the City will match 50% of the cost of a new tree to be planted on City-owned residential property. Choose the species of tree from the city’s approved tree list and once approved the City will does all the rest. Urban trees are important not just for the aesthetics, shade and privacy, but they also help make Calgary the “cleanest city in the world” (2013 Mercer Global Financial and HR Consulting ranking). It was estimated that Calgary’s urban forest removes a total of 502 tons of pollutants each year, with an estimated value of almost $3 million (US Forest Service Urban Forest Effect Model: Calgary Study 1998). One of the fun things to do when walking around inner-city communities is to play “Guest the cost of that tree!” On almost every block there are one or more signs at each infill site indicating the value of the city trees on the lot. The builder is responsible for protecting all city trees and if that isn’t possible they have to pay the city the amount posted to replace the trees. In 1913, William Reader, Parks and Cemetery superintendent unsuccessfully (surprise, surprise) experimented with growing palm trees in pots in the summer in Central Memorial Park as well as around City Hall. This oak tree has been struggling to grow in West Hillhurst's Grand Trunk Park for over 10 years. It looks more like a sculptural piece than a tree. 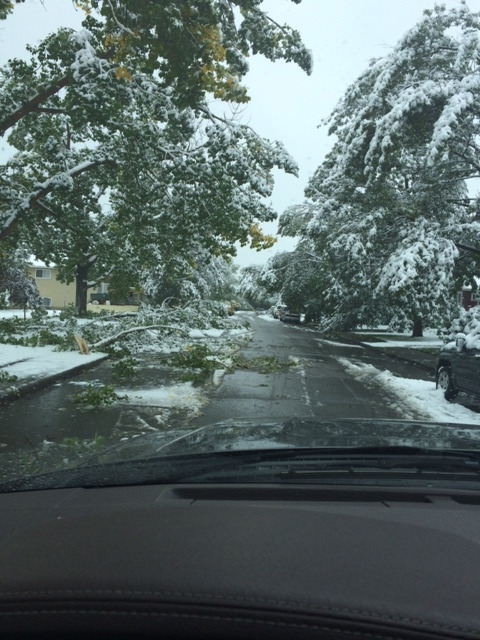 The streets of every inner city community in Calgary were strewn with fallen branches after the September 8 and 9th snow storm. Another reminder that we not only live on the treeless prairies, but on the edge of the Rockies. Urban forest provide a canopy over the street winter and summer. Today, Calgary’s tree canopy is estimated to cover 7% of its over land mass. The goal is to increase this by 1% per decade to a 20% canopy. In the summer, for those Calgarians living in established communities it is hard to imagine Calgary was a barren, treeless prairie landscape. Yes, Mount Royal was a treeless hill less than 100 years ago! Calgarians: Where is your happy place? Guest Blog: John Lewis, Intelligent Futures, a Calgary-based firm focusing on urbanism, sustainability and community engagement. What if we looked at our city from a perspective of what makes us happy? Most of the time, discussion about the evolution of Calgary is focused on the negative and the controversial. While this kind of debate and dialogue is essential in a democracy, we also think it’s important to reflect on what is working well. That’s why we created the #happyyc project. We initiated #happyyc to find out what places make Calgarians happy. We think that by understanding the places that people love, planners, designers, architects, citizens and community organizations alike can help make more happy happen. For the last few months, we have been out on the streets of Calgary and online looking to find out what places make Calgarians happy. The idea of taking happiness seriously has been gaining traction in a number of fields – from Alberta economist Mark Aneilski’s book The Economics of Happiness to psychologist Martin Seligman’s work on authentic happiness to the Bhutan’s measurement of Gross National Happiness. At their core, all these examples are focused on what really matters to people and how to structure systems to enable these good things to occur. In the realm of cities, Charles Montgomery recently wrote Happy City, which investigates the linkages between urban design and happiness. We wanted to take a look at our own city and hear from Calgarians about what places matter most to them. Using a simplified map and a single direction (“Map the spaces that are your happiest places!”) citizens are able to express the places that make them happy. We’re intentionally leaving it open – we’re not restricting the kinds of places that people can choose. Could your happy place be window licking and dancing in the sidewalk ballet of one of Calgary's many animated streetscapes? Could your happy place be along the 700+ km of pathways? Could it be Fish Creek Park or the new Greenway? Could your happy place be one of our live music or theatre spaces? What we’ve seen so far is both fascinating and beautiful. Natural spaces like the rivers, Nose Hill and the pathways are definitely treasured by our participants so far. And before we go into the in-depth analysis of responses, one thing is clear: Calgarians love to eat. The city’s eating establishments are very well represented. Neighbourhoods like Kensington and Inglewood are showing up very often as well. But we’re not done yet. We want to hear from as many Calgarians as possible – ideally, from at least one person in each of our communities across the city. Until October 1, we’re going to keep asking Calgarians to map their happy places. Once all the maps are in, we’ll analyze the responses and share the results with the community. This will give us all some great insights about the places in our city that matter most to us, along with some clues about the commonalities between them. Perhaps you like shopping? Maybe you love our historic districts - Stephen Avenue and Inglewood? Perhaps you have a secret spot in your community? Could the local playground be your happy place? Maybe you love one of our 5,000+ parks? Dog park? To share your thoughts, go to the HappyYYC and follow the three easy steps. The more responses, the more insights we’ll all gain. Step 1: Download and print a map by clicking here. Step 2: Get our your pencils, pens, markers and/or crayons and map your happiest places. Step 3: Send your map to the #happyyc project. If you aren't a Calgarians, I still love to know where is your happy place. Just email me your happy place and perhaps a photo and I will add them to this post. Mount Royal: City Beautiful or Man vs Nature? Calgarians have a long history of being in love with building mansions. Long before there were Aspen Woods or McKenzie Lake Island, there was Mount Royal. Back in the early 1900s, Mount Royal was just a treeless hill southwest of city limits, like many of the hills in today’s edge communities. The land belonged to the Canadian Pacific Railway (CPR) part of the 25 million acres of land granted to them by the federal in government in 1885 as an incentive to build Canada’s transcontinental railway. The first Mount Royal Homes were built on land devoid of any trees. This home was built by D.J. Young in 1910 at the corner of 8th Street and Durham Road. Mount Royal becomes American Hill and you can see some of the early trees. Mount Royal early 20th century. Found this on the gate of the Dower House. If this is what Calgary looked like 100 years ago, imagine what it will look like in 2114. Mount Royal developed rapidly during the 1910 to 1912 Calgary boom, becoming the home of such notables as Colonel James Macleod and the A.E. Cross family. In an ironic twist of fate, by the end of the 20th century - 1996 to be exact - Calgary businessman David O’Brien orchestrated the relocation of CPR’s head office to Calgary, much to the shock of the Montreal business community. Today, many of the early 20th century mansions still exist in Mount Royal alongside many contemporary new ones. In local historian Harry Sanders’ book “Historic Walks of Calgary,” there is a great self-guided walking tour of the community with lots of interesting insights. Like master-planned communities today, Mount Royal is a product of the urban thinking of its time. The “City Beautiful” movement was very popular in Canada in the early 20th century, with its principles of creating urban communities that were less grid-like and more park-like. This meant curved streets, irregular lot shapes, boulevards, an abundance of parks and architectural controls; this is not dissimilar to what we saw in Calgary’s late 20th century communities. Just one of the many curved streets of Mount Royal. You can see the proximity to Downtown with the office towers in the distance. In the early 20th Century, Mount Royal was on the edge of the city. Many of the homes have huge lots that are like private parks. Many of the homes are located at top of a hill, giving them an enhanced sense of grandeur. R.B. Bennett House was built in 1912. Canada's 12th Prime Minister owned this home from 1917 to 1947, but never lived in it. The rounded corner tower with its octagonal roof, it not typical of Georgian Revival homes (Calgary Walks, Harry Sanders, 2005). A carriage house that is now modest Mount Royal home. Sanders points out that while most of Mount Royal fits the “City Beautiful” mold, there is one exception. At the top of the hill between Prospect and Dorchester Avenues, from 10th Street to Carlton sits a grid-like development. This was the 10-acre site sold to Dr. Ernest Willis in 1904 for his hill-top sanatorium before the CPR’s design controls were in place. Today, walking the streets of Mount Royal is like walking through a history book of home styles – English, Georgian and Revival, Art & Crafts, American Foursquare and more. You will also see modern designs influenced by the likes of Frank Lloyd Wright. One example is the Katchen residence at 800 Prospect Ave. SW. Built in 1954 it was the home of Mire Katchen, a successful cattleman who, with his brother Samuel, founded Canadian Packers. The house, designed by Clayton, Bond & Morgridge, is an excellent example of the International style with its post and beam wood construction, flat roof, open floor plan and private outdoor spaces that integrate with the interior living spaces. Another of the mid-century modern homes. Note that there is no sidewalk on this side of the street and no massive driveway, creating a nice balance between man and nature. One of the few homes in Mount Royal with an unobstructed view of the street. You don't get set-backs like this in new subdivisions, even on an estate lot. It is hard to tell if this is a new house or a modernized turn of the century home. One of the things I love about the mansions of the early 20th century is that they took on the names of their owners. Sanders’ book is full of names like Davidson Residence and Coach House, R.B. Bennett House, Coste House etc. each with their own story to tell. A quick scan of current MLS listings shows that you can still buy a modernized piece of history, i.e. a 1910 Mount Royal home on a one-acre lot complete with a heated 6 car garage and a Carriage House. The average Mount Royal home sells for about $2.5 million for a 3,000+ square foot home. It is also interesting to note there are lots of families living in Mount Royal - not just empty nesters. In fact, 25.5% of Mount Royal’s residents are under the age of 19, which is higher than the city average of 24%. If you are a gardener, Mount Royal is a great place to wander and see what survives in Calgary, as many of these gardens are 100 years old. It truly is like walking in a park as the huge lots allow for many huge trees and shrubs, something that isn’t possible on the tiny lots in Calgary’s new subdivisions with all their underground services. Back story: Developers and urban planners in the late 20th century buried the ugly overhead wires to make new suburbs more beautiful. However, the unintended consequence was that large trees could not be planted near the underground services making tree-lined streets in new suburbs a thing of the past. As you wander Mount Royal, you get the feeling of a nice balance between man and nature, something missing in new suburbs where the house, driveway and road dominate. As you wander Mount Royal you will discover historical artifacts like old fieldstone fences and old coach houses that have since become separate homes. Many of the huge lots have been subdivided allowing for new infill homes to be built. Yes even Mount Royal is being densified! One of the many river rock walls from the early 20th Century that add charm to the community. Not everything in Mount Royal is conservative and historic, found these blue trees that have a wonderful luminous quality that is ver contemporary. Could this be an environmental statement? Just one of many infills in Mount Royal; this house could be in any one of a dozen or more inner city communities in Calgary. Stop and smell the flowers in Silver Springs! In 2002, one of nine BirthPlace Forests was initiated along the Silver Springs Boulevard off Crowchild Trail, as the gateway into the community. This joint initiative of BP Energy, Calgary Parks, Calgary Health Region and Golden Acres saw 7,000 trees planted to create a unique urban forest. The BP BirthPlace Forests program was launched to celebrate every newborn baby in Calgary by planting a tree in its honour - the program ended in 2010. However, for Silver Springs’ residents, the forest was the catalyst to create the Botanical Gardens of Silver Springs. In 2006, a small 400 square foot space (size of double car garage) within the forest was the humble beginnings of what is now a 15,000 square foot (the equivalent of 10+ Silver Springs bungalows) garden full of annuals and perennials. In 2009, the community also established its Community Edible Garden, in addition to the regular vegetables boxes as part of a fun “Kids Grow” program. Today the Silver Springs Botanical Garden includes the Oval Garden, Rose Garden, Old Post Garden Shakespeare Garden, a the Wall Garden and an labyrinth. Trail through the Birth Place Forest that gets you to the gardens. One of the many colourful flower gardens. A section of the Rose Garden. The Shakespeare Garden mixes quotation, flowers and plants to create a unique experience. The 1,300-foot Wall Garden is the showpiece of the gardens with its spectacular mix of colours and textures. William Morf, a Silver Springs resident, initiated the garden by starting a 100-foot garden along the ugly noise barrier at the back of his property. Soon others joined in. Today, a merry and dedicated band of 30 or so green-thumbed volunteers contribute over 6,000 hours of sweat labour annually to maintain and enhance the various gardens. Who knows how much money and plant material they have also contributed? The Silver Springs Botanical Gardens is just another example of Calgary’s amazing community spirit and “can do” attitude. The botanical gardens area has become a popular place for locals to “stop and smell the flowers.” This hidden gem should be on every Calgarian’s calendar as a must- walk; Tourism Calgary and Travel Alberta should add it to their websites as a fun and free tourist attraction. Given the gardens are just minutes off Crowchild Trail, there should be a tourist attraction sign informing visitors of the Silver Springs Botanical Garden. For dog owners, the bonus is that the gardens are also an off leash area. And for those with a budding interest in gardening; this would be a great place to find out what grows in Calgary, and you might even be lucky enough to get some free gardening advice. The 1300 foot Wall Garden. Yes, the Silver Springs Botanical Garden is literally just off Crowchild Trail. Calgary’s Silver Springs community extends from the north bluff of the Bow River north to Crowchild Trail and from Silver Springs Gate west to Nose Hill Drive. Construction of the community started in 1972 and was completed in 1980, and since then this community of 9,000 people has aged gracefully. And, yes there really are “silver springs” in the community. A series of springs cascades from the northern bank of the Bow River, which forms the southern boundary of the community. While the area was closed due to the flood in 2013, plans are in place to make upgrades to all of the large natural areas of Bowmont Park – including access to the silver springs. Hopefully it will open again in 2015.